Nearly a week after our kefir arrived, I have some new thoughts (and a bit of research) to share about the fermented food. Mostly, I was curious about how kefir differs from the fermented milk product I'm most familiar with --- yogurt. Our kefir sulked for a day, then gelled up its first cup of whole milk (from the grocery store) in 48 hours. After that, it's been gelling up a cup every day, despite our cold trailer (down to 40 or so at night). That experience alone is a major selling point for kefir over yogurt for the low-tech --- kefir bacteria and fungi will keep working anywhere between 39 and 86 degrees Fahrenheit, while yogurt need a special warming container to hold the critters at 110 degrees. How about flavor? To my untrained taste buds, kefir and yogurt taste identical. Yes, kefir is runnier than store-bought yogurt, but when I went through a phase of making yogurt at home, it ended up at about the same consistency as this homemade kefir, so no big difference there. Unfortunately, Mark's not a fan of the kefir/yogurt taste, so I have to doctor his dose with cocoa and honey. My favorite way to eat kefir is the same as my favorite way of eating yogurt --- swirling in some unsweetened, homemade applesauce (see below). While researching the differences between kefir and yogurt, I discovered one tidbit that should help even those of you who aren't likely to make your own fermented milk products. 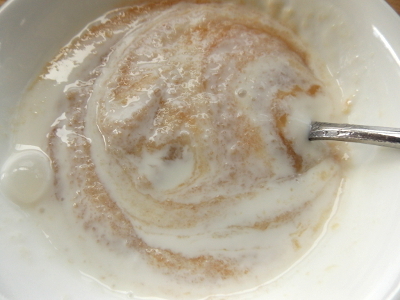 The beneficial bacteria in both foods are found primarily in the whey (the clear, runny part). So, if you buy Greek yogurt (what we've been buying), you get a higher protein content but less of the good stuff because the whey has been strained off. Ditto if you pour off the whey that tends to separate out of plain store-bought yogurt --- stir it back in instead for best health benefits. So, what are the beneficial critters in kefir and yogurt? Yogurt only contains bacteria, and usually you get just one or two strains of Acidophilus sp. and Streptococcus sp. in your yogurt. Kefir is a symbiotic arrangement between bacteria (up to thirty species including Lactobacillus spp., Enterococcus durans, Lactococcus lactis, Leuconostoc spp., Acetobacter spp., and Streptococcus spp.) and fungi. The latter are perhaps the real selling point of kefir over yogurt since these yeasts don't pass through your gut, instead colonizing your intestinal linings where they help you resist invasions of E. coli and intestinal parasites. So eating kefir can cause long-term positive effects in your bowels, in contrast to yogurt, which will only influence your digestion for about 24 hours after ingestion. Which brings me to another point --- how long to culture kefir. I've been culturing just until the milk starts to goop up, but further reading suggests I might get more benefit out of culturing the kefir longer. Over time, the microflora of the milk changes, with the dominant critters giving way to others in a steady progression of Lactococci, then Lactobacilli, next Leuconostoc, then yeasts, and finally Acetobacter. I need to do more reading on the benefits of each kind of microorganism and on how to tell visually when the kefir has reached each stage, but from my first round of research, it sounds like reaching the yeast stage would be most beneficial. Phew, that's a long post, but I'm always excited to learn more when we add new livestock to the farm. You mention that your trailer cools to 40F at night, just over 4C by my calculations. I find that I get headaches when I sleep in a room below 5C. Any tips for sleeping in a 40F environment? I've been reading Sandor Katz's new book, The Art of Fermentation, and have found the whole subject fascinating! I've made sauerkraut for years like the good little Polish girl I am, but this weekend, I stared a batch of lacto-fermented carrots and set out some kombucha I got at the farmers' market to see if I can make my own SCOBY (or mother) so I can make my own kombucha. Thanks for writing up your experience with kefir. I have a good source of grass-fed raw milk nearby, and that may be my next experiment! One thing we like to do with kefir is kefir cheese. The process is super simple, hang the kefir in a jelly bag and drain off some of the whey. This gives a much firmer product that we use to replace sour cream. Since we don't use sour cream that often, we don't always have it on hand. But we generally have some kefir around and an hour or two of hanging gets a very workable substitute with a similar tangy flavor. 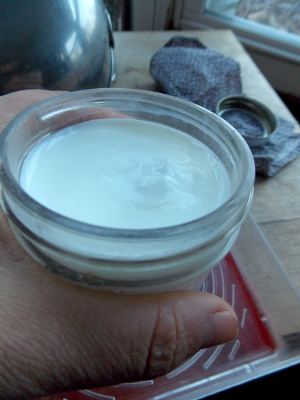 When I was still making my own butter from cream, I used yogurt whey to culture the butter. I never did get around to trying that with kefir whey. We did use it in bread-making though. That seemed to go okay. If you get a larger start the fermentation process goes quicker so you can process larger batches or the same size batch quicker. I would love to have some Kefir Grains. I have had it before and found it to be wonderful. I liked it with fruit such as Strawberries>>> I made smoothies. Maggie --- I like sleeping in the cold, so I might not be a good one to ask. But I do have lots of covers, including two heavy sleeping bags. I cuddle inside a mummy bag, then use the other sleeping bag as a quilt (plus two comforters). I think I generally end up pulling at least some of that up over most of my head on cold nights. Roseanell --- You're officially first on the kefir culture list! Everyone else --- Great to hear about your experiences --- keep them coming! Has Mark been helped by adding this to his diet? You sleep cuddled in a mummy bag??? Not cuddled up with Mark??? Laura --- He's going to post about that eventually, once he's sure one way or the other. I don't think it's been long enough yet for him to tell. Edith --- I'm the world's lightest sleeper and can't stay asleep if there's anything living in the same room. Mark and the cats, unfortunately, have to go elsewhere. Anna...that is the saddest thing I've ever read! It's very interesting to read your perspective on kefir and to know that I was draining the bulk of the good stuff out of the yogurt I strain. Oh well, buying yogurt is costly either way and kefir is way more economical for our family. Banana smoothies this afternoon! Mmmm, fungus! Anna, I think age has something to do with my discomfort with sleeping in the cold. I have been sleeping in the cold for years, with great success. But this year, when it was -37C out there, my head and shoulders were cold enough to wake me during the night. This is new. I am getting older. The rest of my body is fine, under the duvet. I received a great tip from Wendy in North Carolina, who found that sleeping in a hoodie solved the problem of head and shoulder chill. I tried it and for me it works really well! I will be wearing a hoodie to bed when the temperature outside dips below -25C, which we are experiencing a lot of this winter. I have issues digesting lactose and I have never had any problems digesting Beyond Organic's kefir or hard RAW cheeses! This stuff is amazing! Anna and Edith I have grains I'd be willing to share if you can cover postage I am in Colorado let me know if your still looking or interested. April --- I was hoping that Edith would chime in, but it looks like she didn't subscribe to the comments. I appreciate your offer, though!